Prints and metallics: two great trends in themselves but together even better! 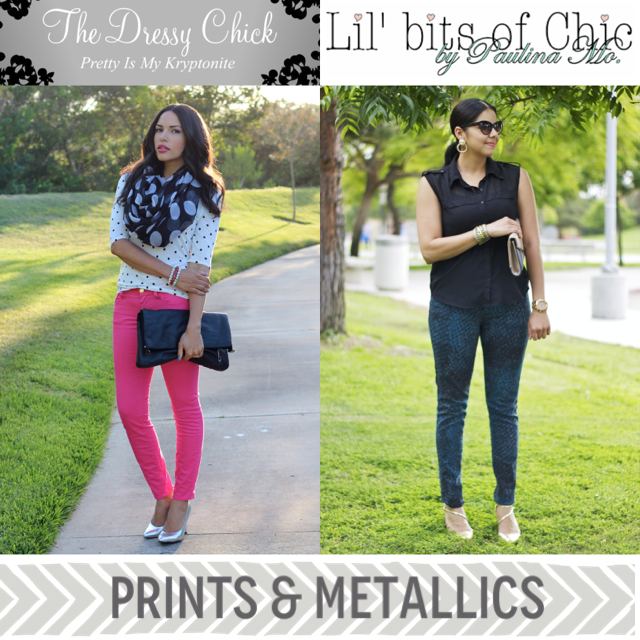 Now multiply that by two outfits in this collaboration post with fellow blogger The Dressy Chick as we bring you our own takes on the Print and Metallic combo. I love the Dressy Chick's take on these two trends! The polka dot on polka dot is such a fun combination and paired with pink gives it a girly touch. Great fashion minds think alike as we both sported metallic heels! 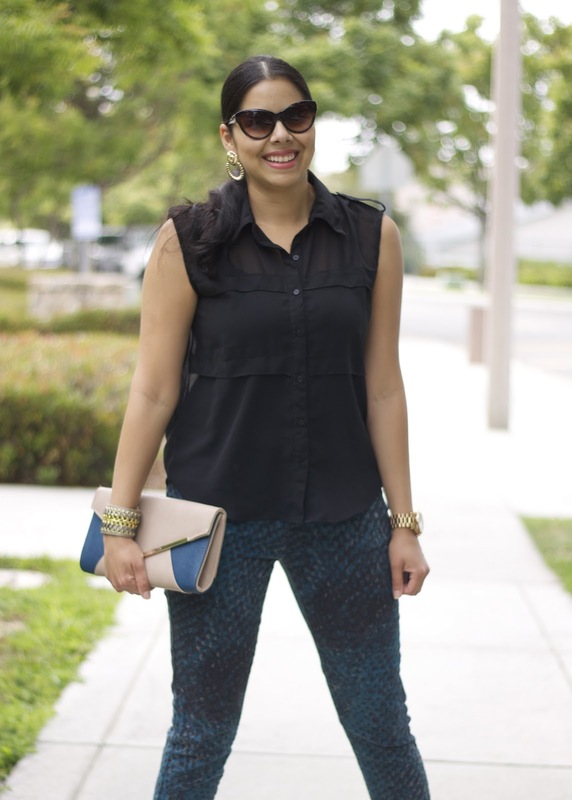 For my print, I decided to wear these black and teal printed pants and accented the outfit with gold accessories. 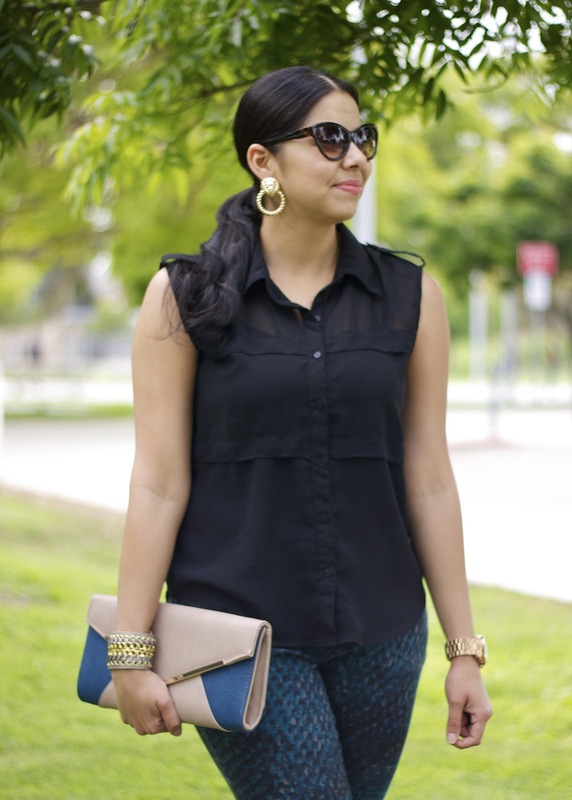 About the Outfit: F21 Top (similar $14) & Earrings (similar here), Target Style Pants (similar), Michael Kors Large Runway Watch, Cuff ℅ Tanya Kara Jewelry (10% off here), Clutch ℅ Urban Expressions. I met the gorgeous Hadasa from The Dressy Chick at LuckyFabb this year and we hit it off! I got to chat with her more when she drove down to San Diego for the Poshmark party I cohosted. She not only brings fashion to the table, but also lots of great info about beauty products! Definitely check out her blog here and if you are in the Laguna Beach area this Saturday, she will be hosting a fun Blogger's Night Out (flyer below). I adore those pants hun! This is a wonderful outfit! I love the metallic details! You look so lovely... Love the shoes, makes your outfit pop. Love the earrings, and really all of your accessories! You are stunning young lady, I love yoru eyewear!)) Great pictures as well! really nice outfit,love the shoes!! I love both outfits!! Your pumps are amazing!!! Love both outfits. Your pants are gorgeous, Iove the shade and print. P.S. : Looking chic as always.